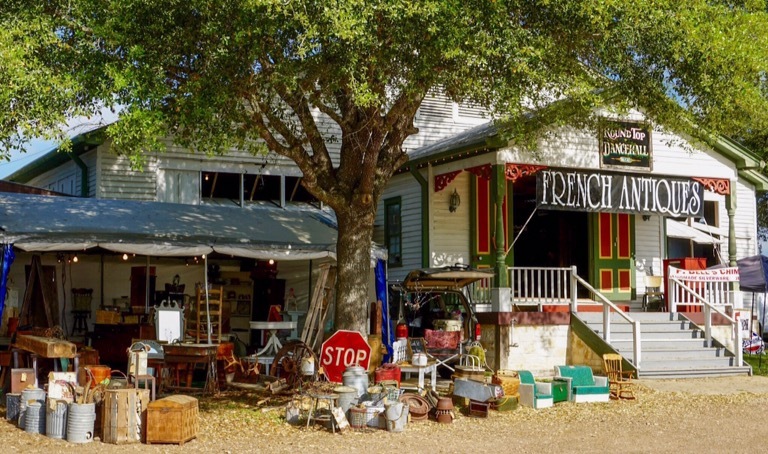 It’s Antique Week in Roundtop! 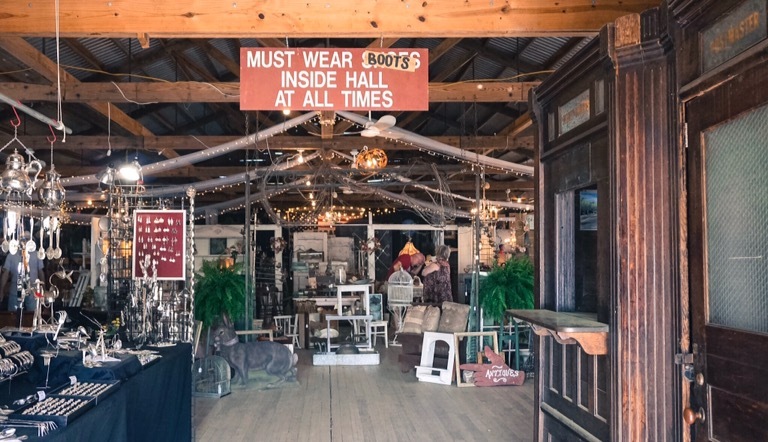 The whole thing started nearly 50 years ago with a single event inside of an iconic red barn. It has since spread to include miles and miles of roadside tents and multiple tiny towns. Some of the areas charge an entry fee but most are free. 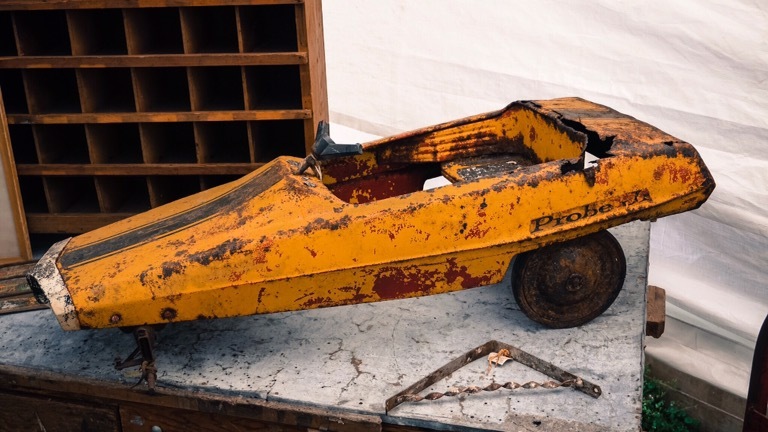 We didn’t pay any entry fees but it sounded like those tents were the one’s to check out if you really wanted only true verified antiques and none of the reproductions or other “junk”. 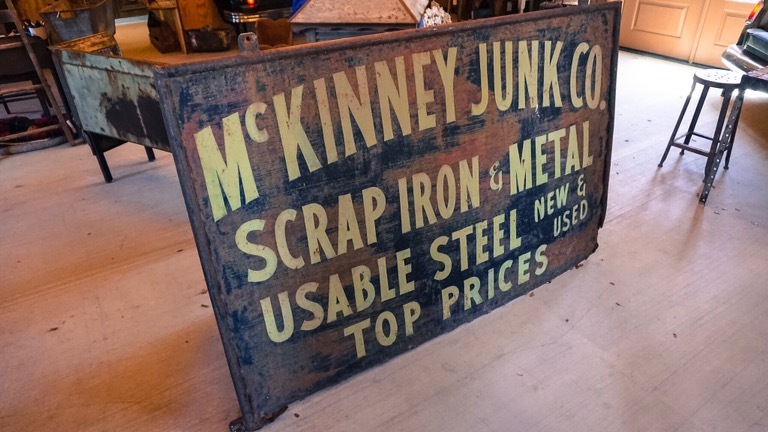 However, at a place like this junk truly is in the eye of the beholder. 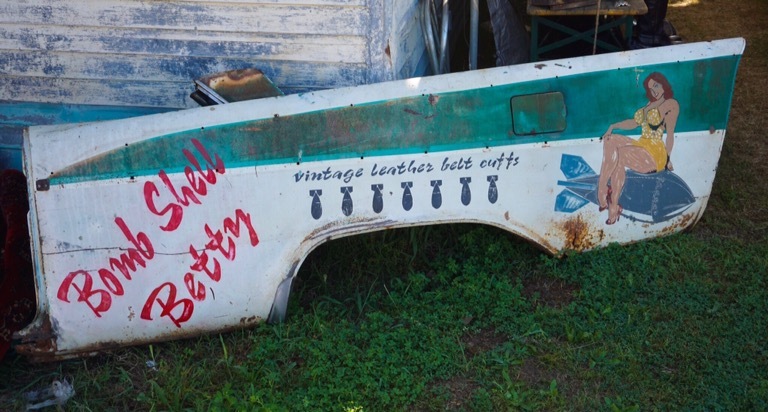 You can find literally anything here, like this verified (by the rust) vintage thunder bucket! 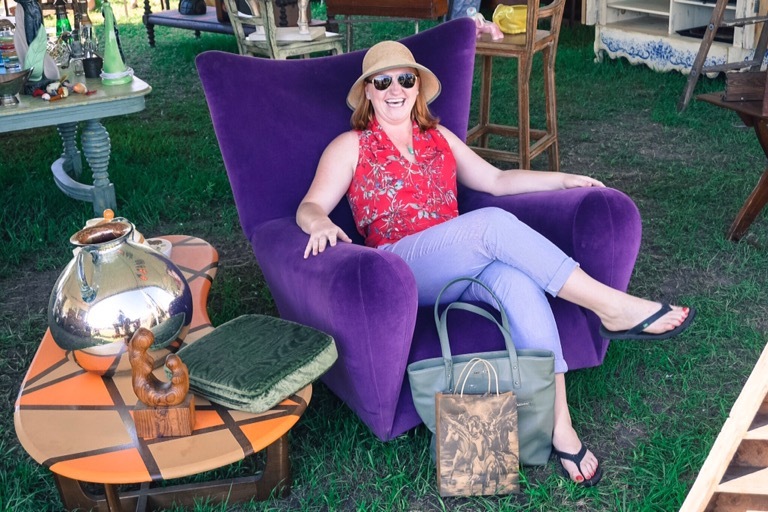 This amazing purple chair was from the 1990s and would have fit right in at the Central Perk on Friends. I can just picture Phoebe sitting here strumming the melody to “Smelly Cat.” I’m still kicking myself for not buying that chair. 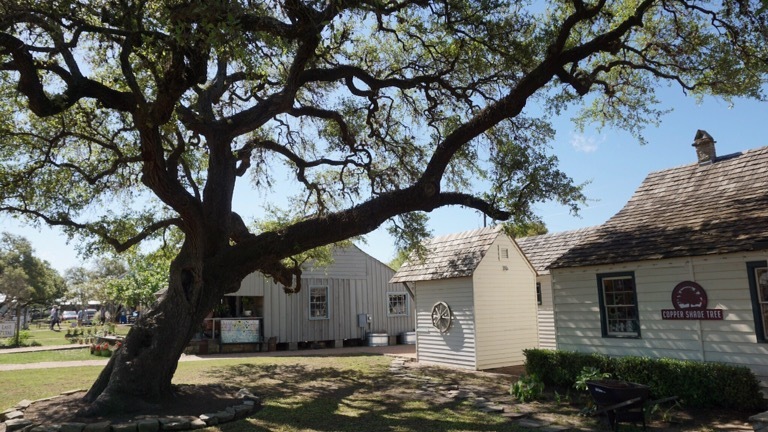 In downtown Roundtop you’ll find this adorable little town square. All of these buildings house shops and restaurants, most of which are only open during Antique Week. This entire town is basically only open twice a year for the fair. 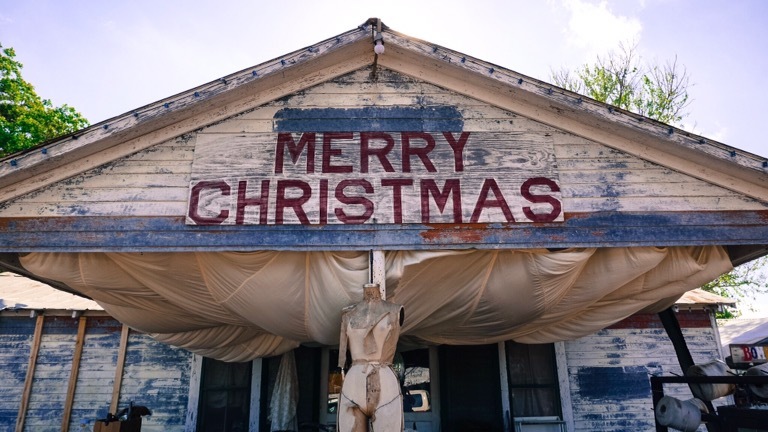 I’ve driven through during other times of the year and while it’s still cute, nothing’s open! Junk Gypsy is probably one of the few stores that keeps year-round hours. I highly recommend stopping by if you’re ever passing through. 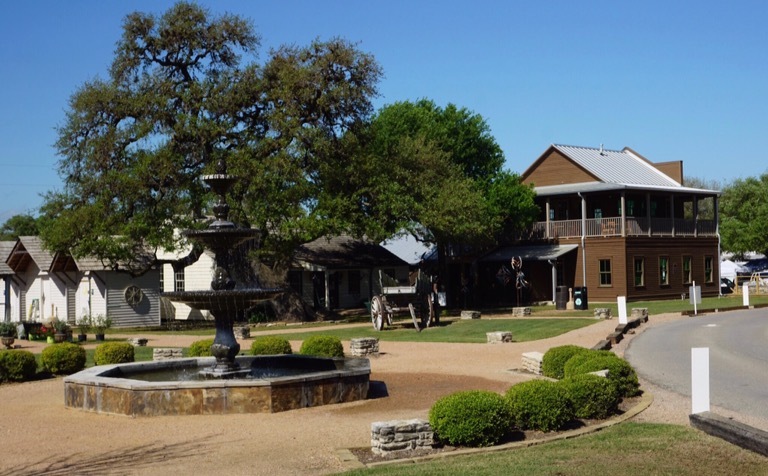 The drive through Roundtop makes for a beautiful detour between Hwy 290 and Hwy 71. Just don’t attempt this as a short-cut during the fair. With the antiquers in town the whole place moves like molasses. I don’t really know the story behind Junk Gypsy. It’s owned by two sisters, who I think might have had an HGTV-type show at some point. This isn’t really a place to find antiques. Everything here is new. But all so darn cute. 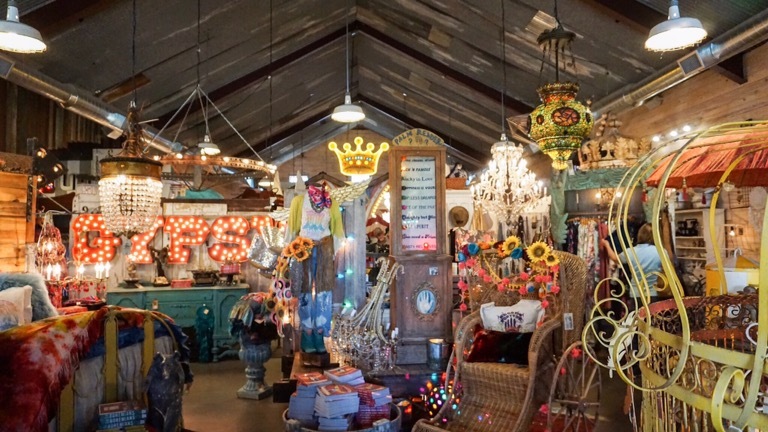 This place will make you want to trade in your regular life and go glamping in your adorable vintage trailer, which is, of course, perfectly decorated in the latest in gypsy-chic home decor. You’ll sip lavender-infused cocktails with your girlfriends while wearing a flowy sundress and fringe-trimmed vest. Maybe do some DIY craft project involving intentionally distressed paint. It will be fabulous. One of the best parts of going on local adventures is that we can share them with our friends and family. Today we got to bring Brandon’s Grandma Donna (we call her Nina). 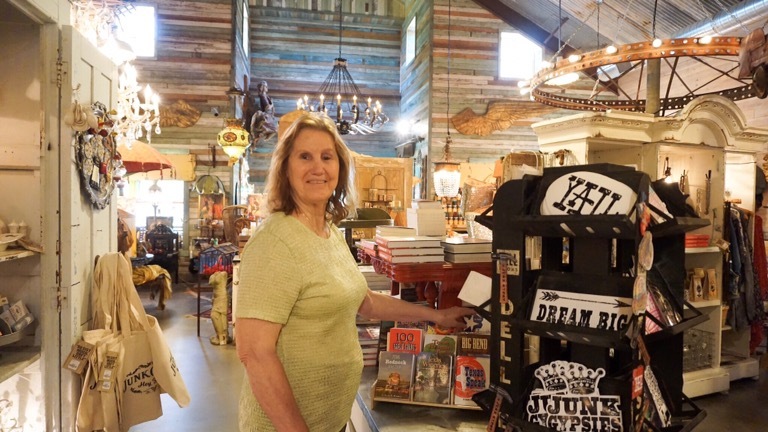 Nina is a La Grange local and has been to the Antique Fair many times. She was an excellent guide and we had such a blast spending the day with her. We love you Nina! 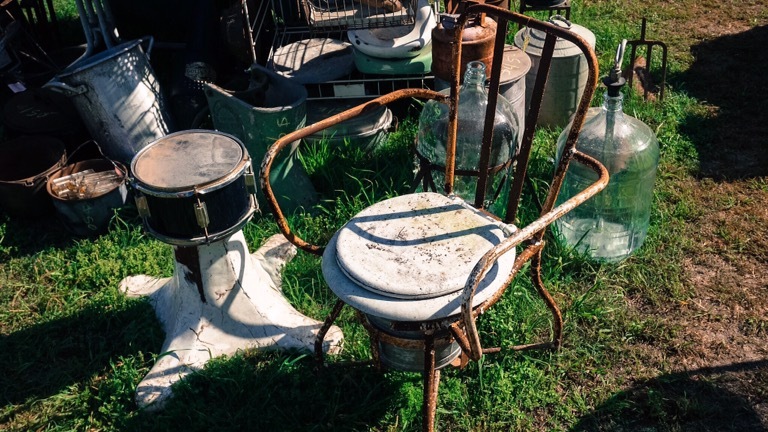 After we left Junk Gypsy we stopped by a barn with more of the “real” antiques. Up until this point most of what we saw was what many would consider “junk” — rusty and dusty stuff of unknown age or origin. Basically just the contents of a hundred re-sale/vintage shops all in one place. 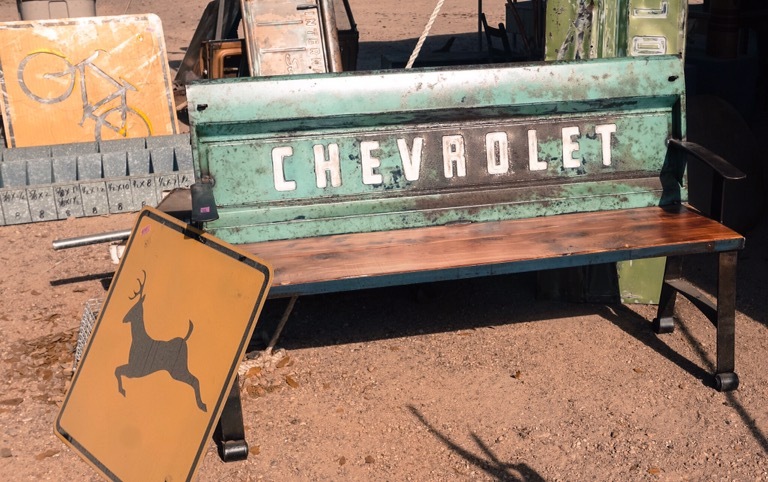 I loved it, but then again, I’ve always been more of a vintage 20th century type of gal and less of a true antiques lover. I love funky old costume jewelry and kitchy decor from the 1950s and 1960s. 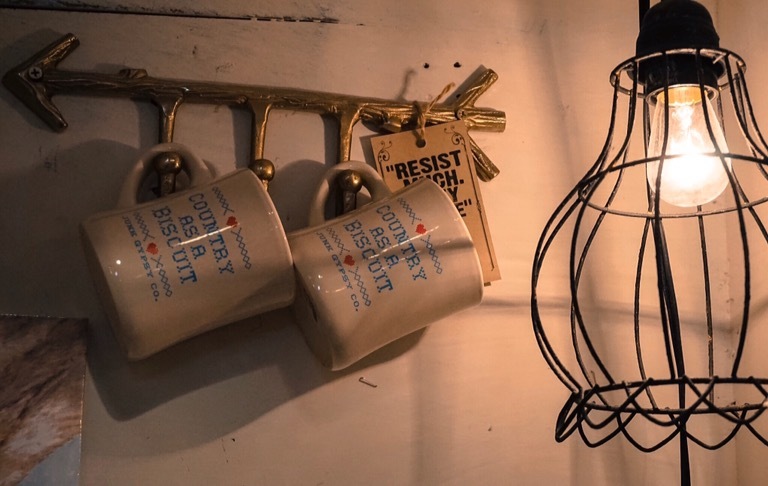 Honestly, I’ve always wondered how people can decorate their home with antiques and still feel comfortable using their furniture. The history is wonderful but I feel like I’m going to damage something just by touching it. But maybe that’s just me. 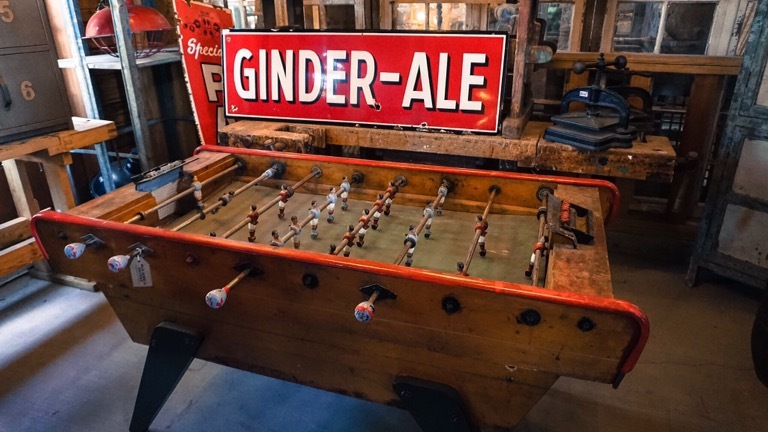 We had a great time wandering around trying not to break anything, but my absolute favorite piece was this antique foosball table. Just look at the detail in their tiny little faces! Seriously, how could you put this in your house and then not let anybody play with it? 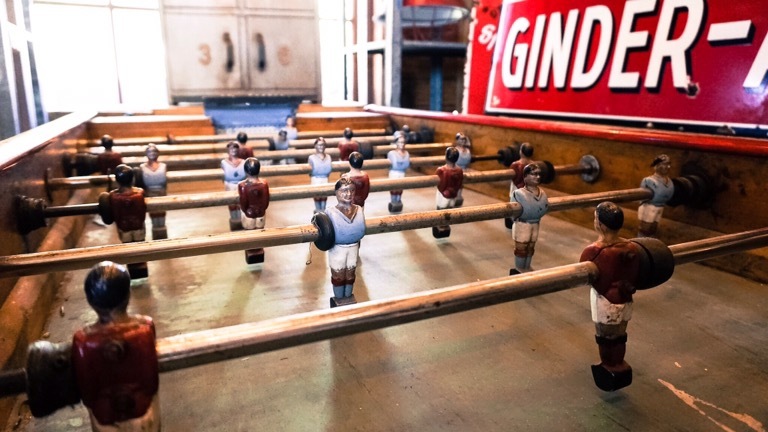 Unfortunately, their little wooden legs are probably also so brittle that they would snap off with the first goal. 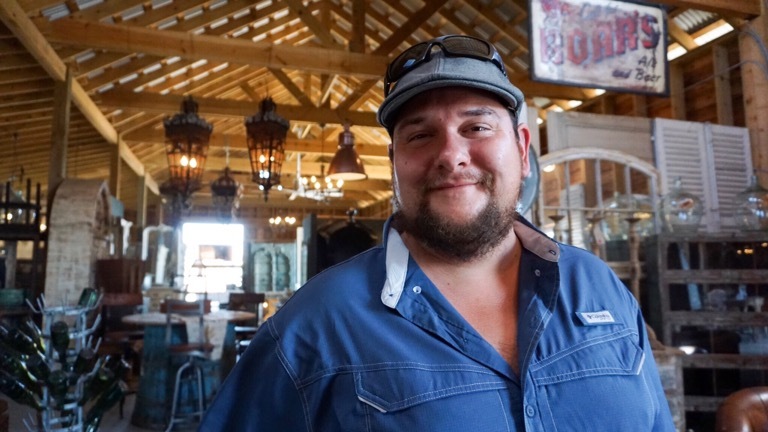 Brandon’s favorite item were the antique cupolas (a type of roof decoration). 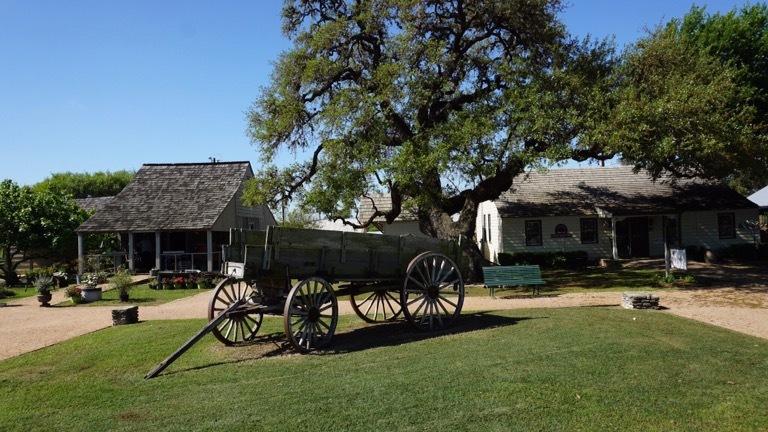 He spent the whole drive home dreaming up home design plans that involved an antique cupola. Not everything in here was actually an antique. They also had a number of very cool light fixtures made from salvaged metal and lots of windows, doors, and pillars pulled from old houses. 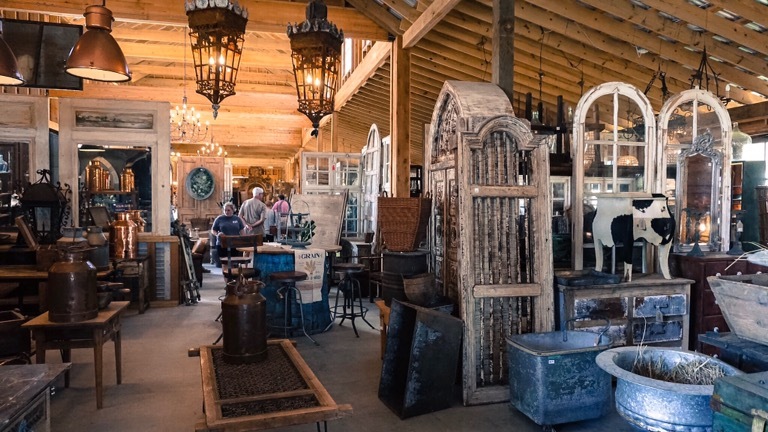 There are a couple of restaurants in Roundtop but that just isn’t enough to feed the masses of people at Antique Week. 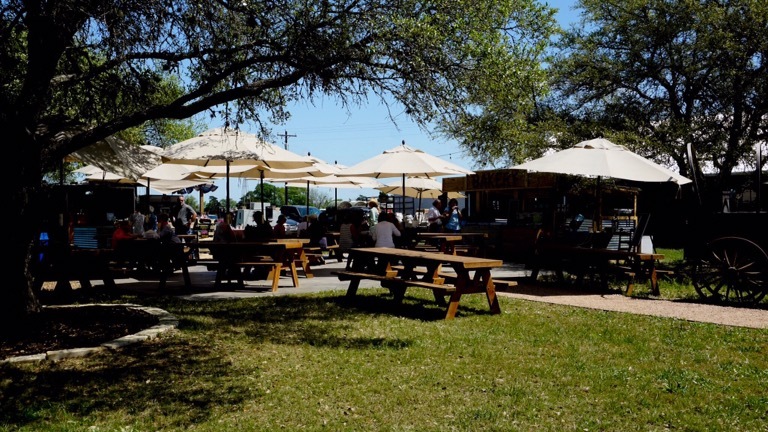 Pop-up food carts are the answer. 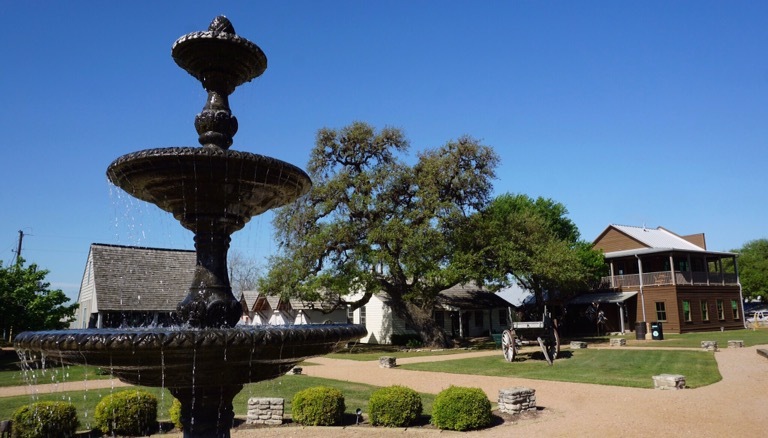 We opted for a yummy BBQ lunch in the courtyard between two of the antique-filled barns. 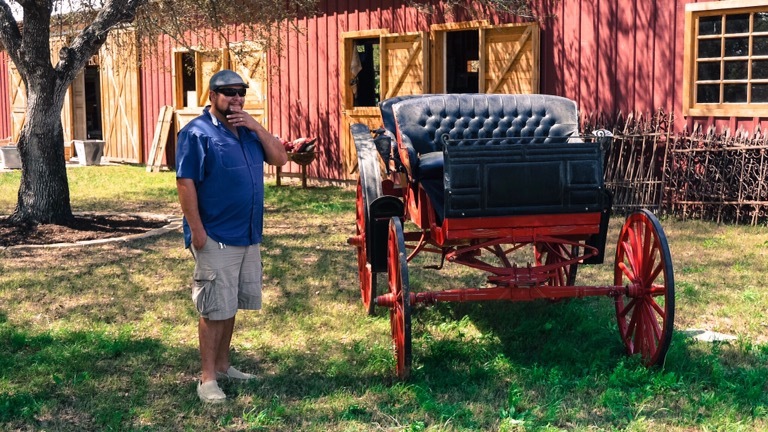 Brandon trying to decide if he should pull this antique horse-cart with his tractor or his four-wheeler. Decisions. Decisions. 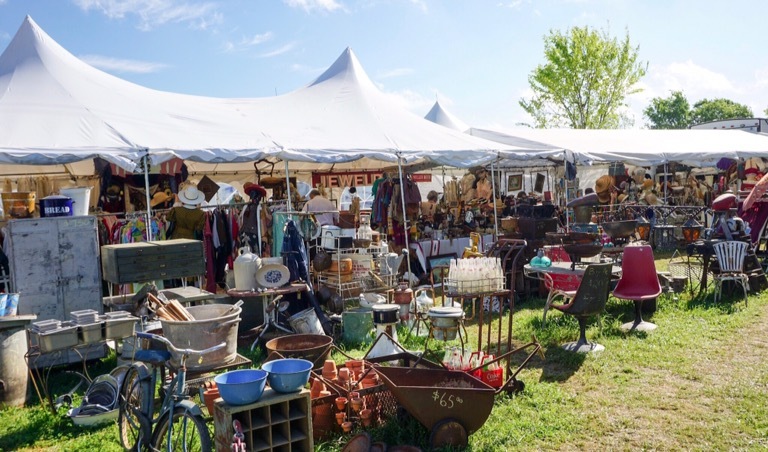 The Roundtop Antique Fair really has something for everyone. You can come here and spend thousands of dollars or only fifty bucks. It all depends on your definition of “junk”. And whether you actually plan to use your furniture. So glad you got to do that. What fun!